There will be fewer certificates of entitlement (COEs) for the next three months starting from February. The Land Transport Authority said yesterday that the supply of Category A COEs (cars up to 1,600cc and 130bhp) will shrink by 9.1 per cent to 3,300 a month. Category B (cars above 1,600cc or 130bhp) will have 2.9 per cent fewer certificates at 2,399 a month. 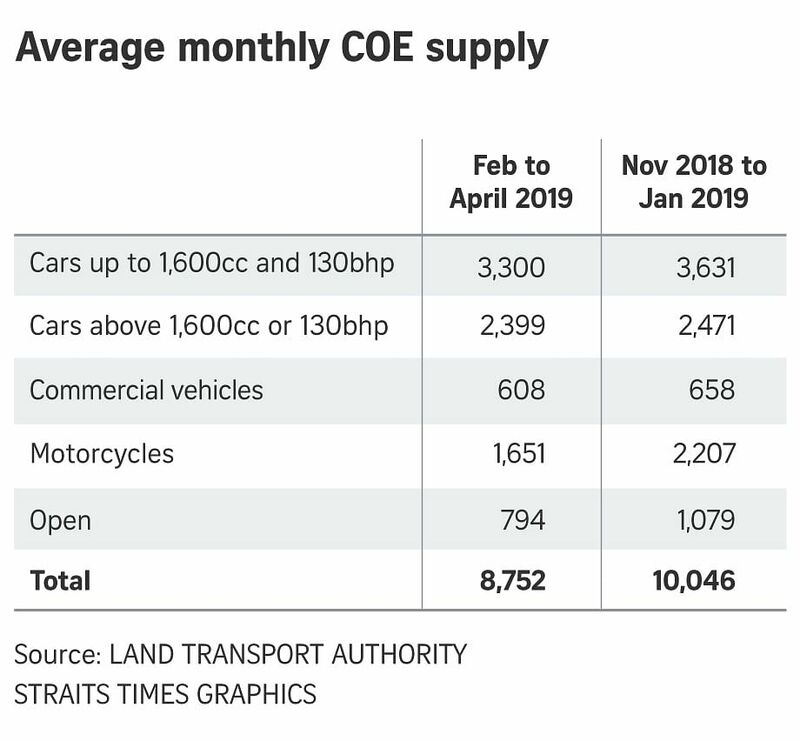 The Open category (for all vehicles except motorcycles but which ends up mostly for bigger cars) will have 26.4 per cent fewer COEs at 794 a month. In all, car buyers and sellers will see their collective supply (including the Open category) shrink by 9.6 per cent to 6,493 pieces a month. Those buying or selling bigger models will see a bigger shrinkage of 10.1 per cent. Commercial vehicle buyers and sellers will have 7.6 per cent fewer COEs at 608 per month. Meanwhile, motorcyclists will see a 25.2 per cent plunge in their COE supply to 1,651 pieces a month. In total, the monthly supply of 8,752 is 12.9 per cent smaller than the November-January quota. Although some motor traders baulk at the prospect of a smaller quota, Mr Ron Lim, head of sales and marketing at Nissan agent Tan Chong Motor, said its impact on car prices may not be significant. But he noted the impact on those who buy and sell bigger cars may be more significant, as the shrinkage in their pool was more than expected – mainly because of the 26.4 per cent plunge in the Open quota. Even so, “a lot depends on whether demand can be sustained, especially whether Gojek’s buying is over”, he said, referring to the new private-hire firm’s arrival fuelling demand for cars. “If Gojek’s buying is over, then again we might not see much fluctuation in Category B and Open category prices,” he added. Motor traders are likely to gauge how customers react to news of the reduced quota before adjusting car prices, but Mr Lim said that “based on past experience, especially during the Chinese New Year tender period”, most customers will not rush in. “Fundamental buying sentiment still remains relatively weak,” he noted, adding it will be this, rather than COE supply numbers, that will have a bigger impact on prices. Industry observers said Gojek is looking to build an initial fleet of 2,000 cars. Even if the company staggers buying over five or 10 months, it will exert upward pressure on COE premiums.